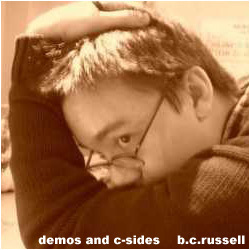 Mr. Russell operates a home recording studio where he records and masters his own song demos. His current gear includes an Apple Powerbook G4 running Pro Tools, ReCycle and T-Racks; AKG 240M headphones, an Ovation acoustic guitar, a Yamaha electric, an Ibanez bass, a Yamaha digital piano, and the his trusty Shure SM-57 microphone. Mr. Russell has been in five bands so far, and hopes to be in many more. In high school he teamed up with his sister for punk group Karess. At Dartmouth, he played in the acoustic group Clean Slate, and later the jam band Funkelstiltskin. In New York he formed acoustic rock group The Very Nerve, and is currently the bassist/vocalist for rock group Negative Ken. All music on this site is free to download and listen to for personal use, and may also be freely distributed to friends. All songs remain the intellectual property of Bayard Russell, and cannot be used commercially in any form without explicit written consent. Bayard Russell © 2004.